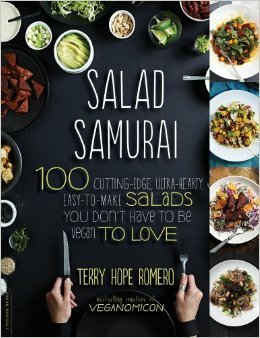 Salad Samurai by Terry Hope Romero. Publisher: Da Capo Press/ Lifelong Books (June 2014). Cooking/Vegan. Paperback. 180 pages. ISBN 978-0-7382-1487-0. Big salads are a major component of my diet. I eat them year round. Usually that’s my dinner. I make great salads. The key is adding as many extras, as much color and variety as possible. So I looked forward to checking out the recipes in Veganomicon co-author Terry Hope Romero’s latest. She divides it by season making it super easy to pick what’s fresh and available. Some yummy, creative salads include Strawberry Spinach Salad with Orange Poppy Seed Dressing; Blueberry Tamari Greens Bowl; Asparagus Pad Thai Salad; East-West Roasted Corn Salad; Green Papaya Salad with Lemongrass Tofu; Polish Summer Soba Salad; Pesto Cauliflower & Potato Salad; Grilled Miso Apples & Brussels Sprouts Salad and Almond Falafel Crunch Bowl. Gorgeous pictures, excellent tips and simple instructions included. There’s a section on salad dressings (something I don’t make myself often enough) and a section on salad toppings. In the dressings section, the Creamy Cilantro Lime dressing, Lemon Tahini dressing, Upstate dressing [sundried tomato, nutritional yeast, tahini, apple cider vinegar], the Marvelous Miso dressing are relatively easy and delicious. The toppings section includes ways to prepare croutons, tofu [there’s Ginger Beer Tofu and That 70s Tofu], seitan and lentils to bulk up salads. There’s lots of vegan deliciousness in these pages. This entry was posted on June 28, 2014, 16:05 and is filed under Books, vegan/ vegetarian. You can follow any responses to this entry through RSS 2.0. Both comments and pings are currently closed.